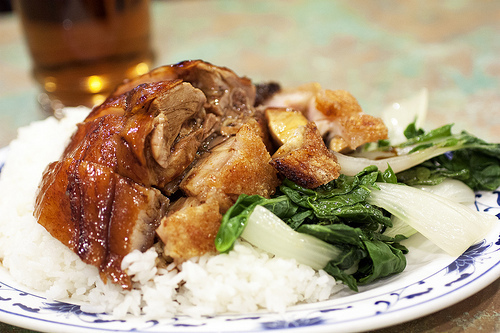 It’s with some sadness I discovered my favorite Chinese roast pig over rice restaurant, Lucky Plaza, recently closed. Looking for a replacement, I popped into Big Hing Wong, another Cantonese-style roast meat restaurant nearby. I ordered the roast pig and duck over rice ($5.25), and the duck was pretty good and the roast pig, while not all tender with a super crunchy skin, the majority was. The only issue is that before serving, both were doused with dark soy sauce making every bite a bit too salty. If only they aimed for the giant mound of white rice instead. The search continues. RIP Lucky Plaza. can’t believe you’re cheating on Wah Fung. @Nicholas – This is roast pig not pork!